The 7-year-old Rohingya boy lies on a tattered mattress on the floor of a crowded government hospital in Bangladesh, bandages covering the spot where a bullet fired by Myanmar troops tore through his chest a week earlier. He is one of 80 Rohingya patients — most males with gunshot wounds — being treated at this overwhelmed medical facility in a coastal city now deluged with more than 300,000 Rohingya Muslims who have fled a two-week surge in violence and a lifetime of persecution in neighboring Myanmar’s Rakhine state. He is the youngest of six patients with gunshot wounds interviewed by The Associated Press on two recent visits. “The soldiers just started firing. I saw my son on the ground,” the boy’s father Abu Tahir said. In the chaos that followed they lost track of the rest of their family before Tahir carried his son across the border to safety. Now he watches as his child’s ribs rise and fall in the hospital, praying that he recovers. Sadar Hospital is the main medical facility for the Cox’s Bazaar area. At the best of times it’s stretched to the limit, with 20 doctors responsible for the treatment of hundreds of patients. 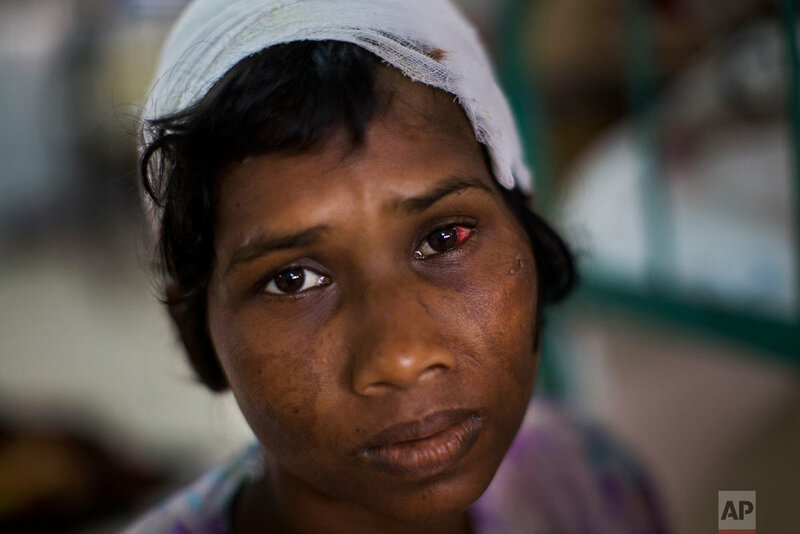 Now it’s at nearly twice its capacity and for the first time its doctors are dealing with injuries like gunshot wounds, blunt force trauma and stab wounds on a massive scale as Rohingya refugees pour in. “We have never seen such violent injuries before,” said Dr. Shaheen Abdur Rahman Choudhury, the head of the hospital. Accounts from refugees show the Myanmar military is also targeting civilians with shootings and wholesale burning of Rohingya villages. Abdul Karim lies on a mat in another corner of the hospital. A mob of soldiers and Buddhist monks attacked his village in Rakhine state, set the houses on fire and sprayed the area with automatic gunfire that nearly blew off his left foot at the ankle. Another bullet wound marked his right shoulder. The stench from his ankle made clear that Karim would lose his foot. “We carried him on a blanket,” his brother Asir Ahmed said, pointing to his shoulders to indicate how the family carried Karim and walked for days to reach Bangladesh. Choudhury said he fears that there will be grievous injuries and deeply infected wounds as the refugees wade through filthy creeks and walk in the humid heat will no medical attention along the way. He said his hospital will need a lot more help and money if they are to cope with what lies ahead. “This is a desperate situation,” he said. In a corner of a room in a sprawling expanse of squalid shanties and tents, Zahida Begum holds in her arms the tiny boy she gave birth to just hours ago. Her eyes are blank. The 25-year-old ethnic Rohingya Muslim crossed into Bangladesh from Myanmar on Sept. 1 with her two young sons, husband and mother, fleeing shootings and arson attacks by Myanmar soldiers and Buddhist monks, her family says. Having spent all their money on smugglers who helped them cross the Naf river to safety, she now sits afraid and unsure of what will come next. The massive Kutupalong refugee camp of tiny mud houses covered with plastic sheets, with its overpowering stench of rotting food and feces, is now her home. She gave birth alone, in the toilet outside the room, says her mother, Dildar Begum. The baby has not been fed since his birth 10 hours ago. She’s feverish and shivers so much that her mother lit a small, smoky fire to warm her up. She is still bleeding from the birth. No doctor is in sight in the camp, set up in the early 1990s to accommodate earlier waves of Muslim Rohingya refugees escaping from convulsions of violence and persecution in Buddhist-majority Myanmar. There are no clinics or pharmacies or even basic first aid centers. New arrivals like Begum and her family survive on the kindness of older refugees and on food handouts from local volunteers and aid groups: rice and curry once a day if they are lucky. “She’s been crying from hunger,” her mother said of her weak and ailing daughter. Begum simply stares. Myanmar’s government refuses to recognize Rohingya as a minority group and denies them citizenship, even though about 1 million were living there until two weeks ago and many families had been there for generations. The exodus of Rohingya like Begum into neighboring Bangladesh is massive in scale. The United Nations says 270,000 have crossed over since Aug. 25. But it’s really impossible to accurately count how many have come. Every single day thousands upon thousands enter Bangladesh. They cross the Naf river that runs between Myanmar and Bangladesh on rickety wooden boats. The journey is especially dangerous now because the river is swollen from months of monsoon rains. Others cross the land border between the two countries, walking for days through forests to escape detection. In Bangladesh, one of the world’s poorest and most crowded countries, these people say they finally feel safe. But hunger and illness are a constant presence. With the influx pushing existing Rohingya refugee camps like this one to the brink, Bangladesh has pledged to build at least one more. But it’s unclear when that will happen. “Our teams are seeing streams of people arriving destitute and extremely traumatized,” including many in need of urgent medical care for violence-related injuries, the aid group Doctors Without Borders, known by its French acronym MSF, said in a statement. The International Organization for Migration has pleaded for $18 million in donations to help feed and shelter tens of thousands now packed into makeshift settlements or stranded in a no-man’s land between the two countries’ borders. In the Kutupalong camp, reporters saw several newly arrived children burning with high fevers. At the Cox’s Bazar district government hospital, four Rohingya men with gunshot wounds described Myanmar soldiers entering their villages and randomly opening fire. The hospital said it was treating 31 other men with gunshot wounds. Myanmar’s government has denied any abuses by its troops and instead says it is fighting terrorists. It says a group of Rohingya insurgents and villagers themselves set fire to their own homes in Rakhine state. It offers no explanation of why an already miserable and impoverished group of people would destroy their own homes and exhaust their meagre savings to take treacherous journeys to an unknown land for a life of extreme uncertainty. In the camps it’s often hard to separate the anguish of the new arrivals from the suffering of those who have been here for years or decades. Outside Begum’s room a young Rohingya man stands, holding back tears. Kutupalong camp is the only home 22-year-old Farid has ever known. He was born here to parents who were part of the first wave of refugees to flee Myanmar. He says life in the wretched place makes him doubt his faith in God. He did not want to give his last name or be photographed because he has enrolled in a local school using fake Bangladeshi documents. As a refugee he is only given education up to the fifth grade. “There is nothing, nothing here ... no doctors, clean water, education,” he said, rage and helplessness coursing through his skinny body. He wants to be a doctor. He wants to break out of the cycle of misery his people have been trapped in for decades. He flits between hope and despair, sometimes in the same sentence. What of the tens of thousands of new refugees who are putting incredible pressure on the already teeming camp? On Friday afternoon, two infants were interred in the cemetery that has grown on the edge of the camp. A 6-day-old baby, born on the road as his family escaped, was buried next to a 2-day-old child born to a long-time resident. Text from the AP news stories, Bangladesh hospital struggles to cope with Rohingya wounds, and Fleeing Rohingya face hunger, little hope in Bangladesh camp, by Muneeza Naqvi.